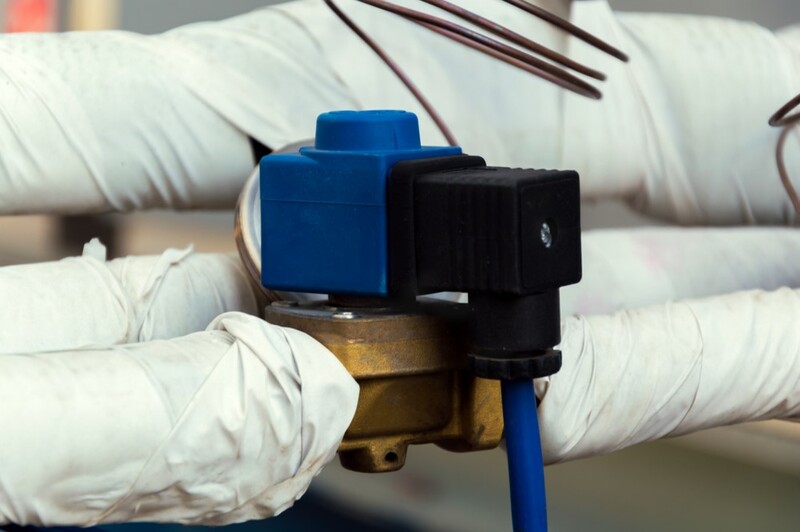 Electronic Expansion Valves (EEV) are used in a range of refrigeration systems such as commercial cool rooms and walk-in freezers to precisely control the flow of refrigerant into the evaporator. They are an evolution of conventional Thermostatic Expansion Valves (TEV) that use springs, bellows and pushrods to control the amount of refrigerant released into the evaporator and hold a constant evaporator superheat. The EEV is a more sophisticated design and operates with greater precision and efficiency. EEVs control the flow of refrigerant entering a direct expansion evaporator in response to signals sent by an electronic controller. This allows the refrigeration system to operate much more accurately and efficiently. A small motor called a step or stepper motor is used to open and close the valve port. Controlled by and electric controller, they rotate a fraction of a revolution for each signal sent to them. They can run at 200 steps per second and remembers the number of step signals send, meaning it can return the valve to any previous position at any time. This allows the valve to precisely control the refrigerant that flows through it. Electronic signals sent to the EEV are usually done by a thermistor connected to discharge airflow in refrigerators. A thermistor is a resistor that changes its resistance as its temperature changes. Other sensors detect evaporator superheat, protecting the compressor from liquid floodback under low superheat conditions. Pressure transducers can be wired to the controller to control pressure/temperature and superheat. Pressure transducers have three wires, two of which supply power while the other is an output signal. As system pressure increases, the voltage sent out by the signal wire will increase. The controller uses this voltage to determine the temperature of the refrigeration system using a pressure/temperature table programmed into the controller. The main benefit is that by using EEV, you’re going to reduce energy consumption from the refrigeration system, as well as getting better performance. The EEV is useful in many different applications because of the combination of compressor floodback protection and the ability to maintain refrigerator case discharge air temperature set point control. Some EEV controllers can also be programmed for custom control applications.